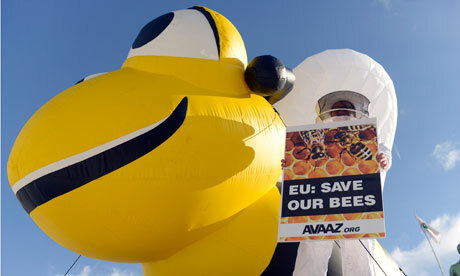 There was widespread anger as the European proposal to protect bees from toxic pesticides failed to get a majority. Campaigners across the continent hoped the European Commission’s proposed two-year suspension of neonicotinoids would be passed, but major nations, including UK and Germany, failed to back the plan in a vote on Friday. The result leaves environmental campaigners, scientists and some politicians bitterly disappointed. “Britain and Germany have caved in to the industry lobby and refused to ban bee-killing pesticides” said Iain Keith, of the campaign group Avaaz. “Today’s vote flies in the face of science and public opinion and maintains the disastrous chemical armageddon on bees, which are critical for the future of our food. Suspensions have previously been put in place in France, Germany, Italy and Slovenia, but the EC proposal would have applied across all 27 member states. Many major agricultural nations, including France, Italy, Spain, the Netherlands and Poland, voted for the ban, while the UK and Germany abstained, with Hungary and Romania leading those opposed. However, the ban could still be enforced within months if the EC takes the decision to an appeals committee. Friday’s vote, by member states’ experts on the standing committee on the food chain and animal health, saw 13 nations in favour of the ban, five abstaining and nine opposing, meaning there was no majority for or against. This entry was posted in Bees, Environment, Farming, Green, Nature, Wildlife and tagged Avaaz, conservation, Europe, European Commission, pesticides. Bookmark the permalink. We don’t have to give up. If you see any opportunity to put pressure on Owen Paterson, I hope you’ll tell us. How dare he not vote? It is so amazingly short sighted to uphold a pesticide that kills our partners in agriculture, the bees. I actually wanted to put a “very much do not like” on this post but WordPress only offers “like”. I do like that you keep us up-to-date on this issue but I don’t like what you’re telling us. I’m not shooting the messenger but I’m not happy. Let’s hope sanity prevails during the appeal. Yes it’s isn’t happy news but it’s not over yet. I’ll be looking at ways to keep the pressure up before the appeal. Thanks for the information. Makes you wonder what interest each voting party has in the pesticide business? I really hope that something can be done about this! So sad and shortsighted of them.